This is the dramatic opening of What Came Before, the brilliant psychological thriller debut by Melbourne writer Anna George. The rest of the novel reveals how the murder came to happen. We see Forrester’s wife, Elle, before her death. She’s working in the film industry, having left a career in law. With one successful film behind her, she is busy directing another. This latest is about “limerance”, the early stages of romantic love. Elle encounters Forrester, a high-powered lawyer she remembers from her legal days. She is immediately attracted. By what? His looks, the interest in art they share. Certainly not his sociability, as he proves indifferent to her friends. As they begin their relationship, she experiences an almost delusional infatuation – the “limerance” of her film’s title – which leads her to ignore warning signs that the relationship isn’t healthy. Unknown to Elle, Forrester’s marriage has disintegrated, leaving him angry at his ex and missing his young step-daughter. He’s also a frustrated artist, a control freak and a very unhappy man. Throughout the narrative, point of view switches from Forrester, as he dictates his “witness statement” and consults a retired QC for legal counsel, to Elle, as she lies in death – or the imagined transition that follows death. This dual narration, swapping tenses between past and present, makes for compelling reading as we are led inexorably to the inciting incident, Elle’s death. One question often asked about women in abusive relationships is, “Why did they stay?” What Came Before answers this question. “Limerance” makes us idolise our partners, letting us see only what we want to see; tells us to forgive their failings, to look only at their good qualities; blinds us to the escalating “cycle of violence”. The longer we stay, the more we believe they are essentially “good”, that their character defects are a result of damage done in childhood, that we are connected to them in some essential way, the more dangerous the relationship becomes. Anna George has drawn on her own experience* of “emotional abuse” to create the relationship between Forrester and Elle, and her experience shows. For me, though not for all reviewers, she manages to make Elle sympathetic, despite her irrational choices. George also conveys what it’s like to be the man who resorts to violence, his self-justifications, his belief that he was provoked. If I had one criticism of the characterisation of What Came Before, it’s of the moment when Forrester makes a transition from “emotional abuser” to “physical abuser”. For me, the transition appeared too abrupt. Thinking about his behaviour in terms of “narcissistic rage”, however, I can make more sense of it. Far from being egoistic, Narcissists lack the internal resilience that would allow a healthier psyche to take criticism, perceived rejection or opposition. In this light, George gets the psychology for Forrester right; the result is believable and frightening. The publishers have described this novel as “literary”, and in the vein of Gillian Flynn’s Gone Girl. 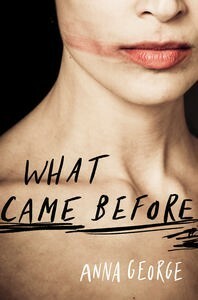 What Came Before is clever, like Flynn’s novel, but the cleverness isn’t at the expense of its emotional truth. The characters come across as real, their motivations consistent, their delusions understandable. Does this make it “literary”? It’s a well-written psychological thriller which deserves to become a best-seller. Anna George has been added to my already impressive list of “must read” Australian female crime and suspense authors. I can’t wait for her next book. * Anna George mentioned this in an interview with Carol at Reading, Writing and Riesling blog, here. I just finished this book and you are spot on with the quote: “the result is believable and frightening”. Unfortunately for me, the “result” hit a bit too close to home and I think I’ll have trouble reviewing this. Great review – particularly your observations about emotional vs physical abuse. I probably didn’t think as deeply about this book as it deserved – I picked it up as a ‘Gone Girl’ type page-turner (which it certainly was!). Thanks, Kate. I think that’s part of the book’s brilliance. It works as a page-turner and also appears to be cathartic (one hopes; rather than re-traumatising) for those of us who identify with Elle’s situation. Gone Girl didn’t make me feel half so much. This sounds really interesting. I like a book that is willing to delve into difficult issues, although they can sometimes be hard to read. I’d be interested to know what you think of it, Annabel – particularly whether you’d agree with the publisher that it’s “literary”. Thanks, Karen. Tag me if/when you review it, will you? I’d love to know what you think. Enjoyed your review. I’m wondering whether the non-simple narrative point of view tends it towards the “literary” appellation? You tag it “unreliable narrator” and talk about dual narration swapping tenses. This doesn’t sound like straightforward genre fiction to me … But I don’t read crime genre so I may be out of touch. Either way, it sounds like an interesting read with some meat to it … I hope that doesn’t sound callous as it’s not meant to. Thanks for commenting, Sue, and sorry it’s taken me so long to reply (back on my PC, instead of my unreliable iPad). I’ve added it under “literary” for the AWW challenge on the strength of your comments. Is Gillian Flynn considered literary? If so, then I’d say AG is, too. Oh, I understand Elizabeth … No worries. I haven’t read Gone Girl but from what I’ve read I think it would because I think it plays with or departs from conventions of its genre. It’ll be interesting to see whether What Came Before is nominated for any prizes. I’m not sure the themes of the novel would warrant it (unlike, say PM Newton’s The Old School), although who knows? Who knows indeed … Did people pick Peter Temple to be nominate for the Miles Franklin I wonder? Good point, though I’d agree without hesitation that his work is literary.